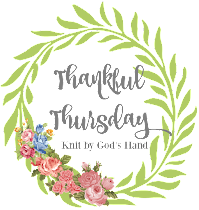 We'd even go all crazy every now & then & have a fun day of getting to play Oregon Trail!!! I dont even know what we learned on these things... honestly... were they just big typewriters? The teachers desk was in the middle of the room. When we would finish a project, we had to print it out, on our nice pin-feed-paper printer, tear off the sides of the paper & then put it in the teacher's box on her desk. yeah... a skirt... Thank God I listen to my mom & always made sure my underwear didnt have any holes in them. The memories of high school... & you all wonder why I didnt go to my 20 year reunion? yeah, to me, that qualifies as a wardrobe malfunction! Oh I remember those days! Seeing the computer cracked me up & the image on you with your feet in the air made me lol...sorry. I'm going to make a note to play along with this next week. Yeah, I think that definitely qualifies as a wardrobe malfunction! I remember those big giant computer monsters too. We've come along way from those days...God, it makes me feel old! I even went to computer camp, where we learned to write DOS programs! Hysterical to think about now. You poor thing; of course you were wearing a skirt that day...Murphy's law, right? I love your version of a wardrobe malfunction! Oh, weren't those the days! The summer camp I used to work at still uses a dot-matrix printer for labels. Pin holes and all. That's hilarious! Boy I remember those computers - except I'm older than you & didn't touch one until college. Shoot, our high school only had one electric typewriter LOL. That was indeed, uh, unfortunate. As an adult not such a big deal, but as a high school kid, I'm sure that was absolutely mortifying. First think I thought....Oregon Trail!!!! I've thought about that game off and on for a month or so now! 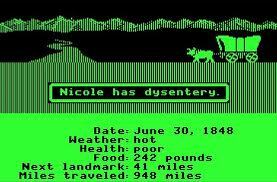 We totally loved the days we got to play Oregon Trail in school! Although we weren't cool enough to have the chairs with wheels it sounds like a good thing! I never had that particular wardrobe malfunction in school...I did have my share and I can totally relate! Oh my I remember those computers and chairs. Great story telling today. Enjoy your day. What a funny story too RJ! I can just see you with your skirt covering your face and shoes in the air...hysterical!! Didn't know you posted at Mama Kat's!! YAY!! I so remember those computers and Oregon Trails seemed like such cutting edge technology!!! oh my gosh I remember those computers & Oregon trail haha! I remember the computers, like the others, too. What a flashback...Flash forward and we now have flash drives. I appreciate technology every day. 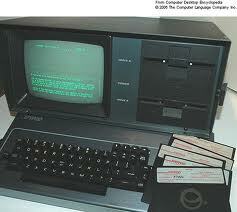 We had Radio Shack TRS-80's. Well written and well illustrated. I, on more than one occasion had my skirt fall completely down while walking into work at a large corporation. How mortifying. Rebecca...you simply make me laugh! THANK YOU!!! What is it about all of us having trouble with our skirts? Oh my I just had a major flashback of computer class. Poor thing. I am so sorry you have to live through that. Thank you for stopping by and the kind words! I so need to check out all of your blogs. I am start Project 365 soon and I need to start a book blog badly. And, then you died of dysentery! Yay, another John Hughes reference! And I remember frequently wearing heels so high my ankles would give out in the middle of walking sometimes. I don't remember actually falling due to it, but yeah...kind of embarrassing, still. Especially if someone saw me trying to continue on as if it never happened! Hahahaha! That visual is going to keep me happy for the rest of the night. Poor thing. Oh my word! That is too funny, girl!!! I do remember those computer days. I am ashamed to say that one of my high school classmates was so good on the computer that he would type our vocabulary words really itsy bitsy so we could tape them to our pens. He sold each copy for a buck. Bad, but I had the English teacher from down under (who I am not emulating). My wardrobe malfunction was when my bra came undone while I was playing a basketball game...at school. Those were the days before sports bras. Hence, I feel your pain. Enjoy your wonderful week with your babies! !